Prefer to shop local? Find copies of my Compost Gardening Guide at independent bookstores through IndieBound.org. Can you compost and garden at the same time? Of course you can! That's one of the main ideas behind Compost Gardening, which is all about bringing compost to the heart of the garden, where it belongs. When you compost on site, in your garden, the benefits to your soil begin on day one. When Deb Martin and I wrote Compost Gardening, we looked for -- and found -- many ways to make composting more practical and rewarding for gardeners. There are hundreds of ways to compost, but we ultimately settled on about a dozen doable methods. Then we needed over 300 pages to cover them. But don't get the wrong idea. The main thing I want to say here is that composting shouldn't feel complicated or difficult. If it does, get a stationary composter or punch some holes in an old garbage can. Start filling your container with food waste, pulled weeds, and old mulches. 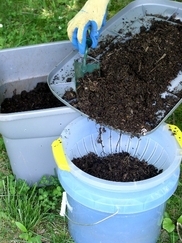 Dump in some water from time to time, and within a few months you will have compost. Deb Martin and I won a Silver Award of Achievement from the Garden Writers Association for Compost Gardening, which never would have happened in a million years if either of us had written the book on our own. We shared a hotel room for three days when we were just getting started on the project, which we highly recommend as a compatibility test. Six years later, we're still pals. Deb brought so much to this book! An extension agent's daughter, Deb had edited Rodale's Book of Composting when she worked at Rodale Press. But professional qualifications aside, Deb is funny like you have to be when you're raising two boys, and she's always nice. She often loads up her worm bin and takes it to school classrooms, because that's the kind of thing Deb likes to do with her time. "A certain measure of sorrow marks the end of the growing season, but that grief can be lightened by the realization that a new composting season is beginning." Want worms? We suggest using the worms already present in your garden to practice "catch and release" vermicomposting.